My fiber art is exhibited by three galleries. 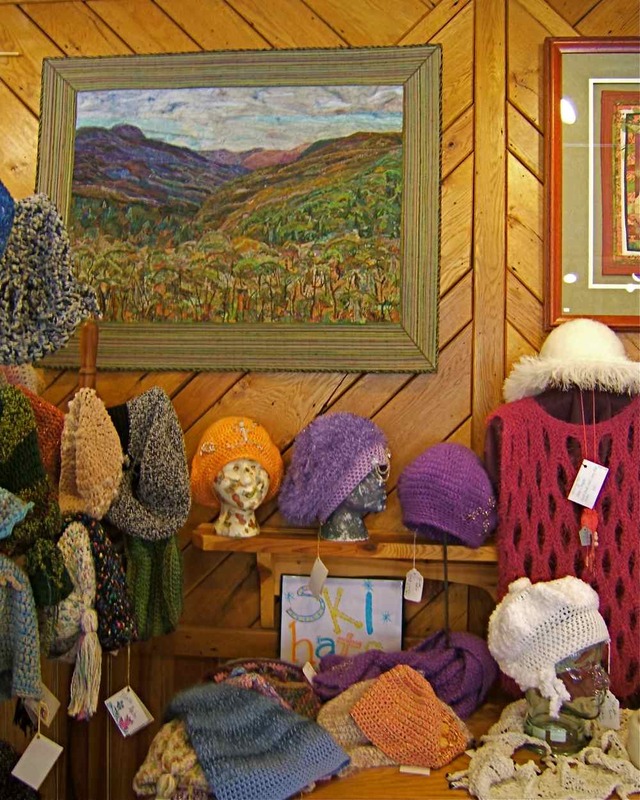 Pieces that are currently being sold are listed below in a separate section for each gallery. 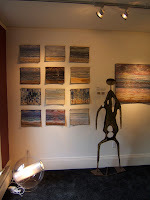 To purchase any of these pieces please contact the gallery. Every summer I demonstrate for one weekend at the gallery. 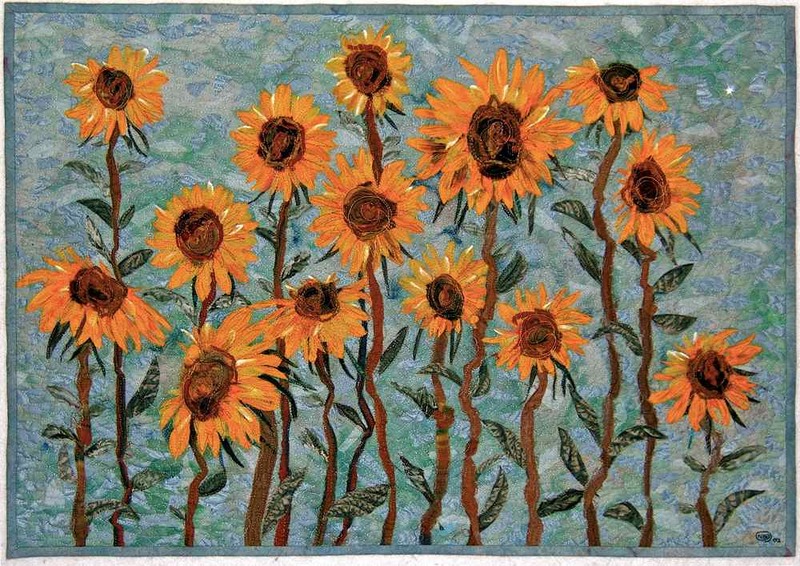 This series of art pieces is exclusive to Good Goods gallery. 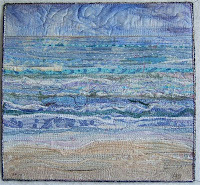 Eventually there will be 100 pieces that portray a particular view of Lake Michigan in its many moods. 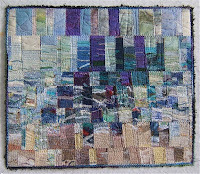 They are composed in a collage technique developed by Nellie that utilizes recycled and re-purposed materials The tone, mood, time or type of day is determined by the first scraps of fabric laid down. 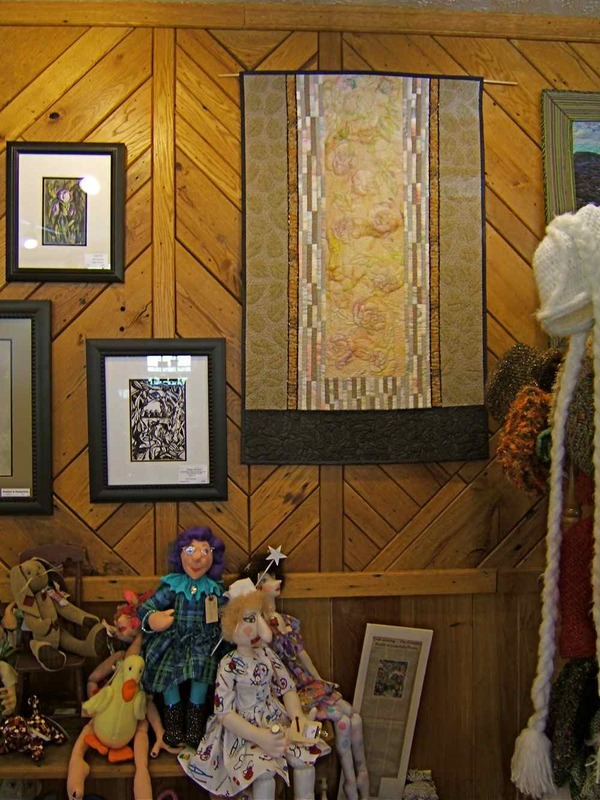 The rest builds from there to complete these quilted fabric art pieces. 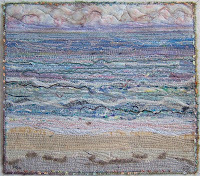 Click on the title next to each photo to read about the creation of that piece on my blog, "Nellie's Needles". Sunny warm days influence the mood. Inspired by a gloomy cold day. Events in my life made me feel sad and pensive. 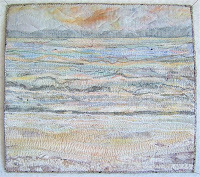 Inspired by a mid-summer day. One of the last warm days of summer. The low sun is a glare on the water and sand. 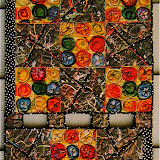 Every 25th piece is an abstract made from the trimmed off edges of the previous 24. 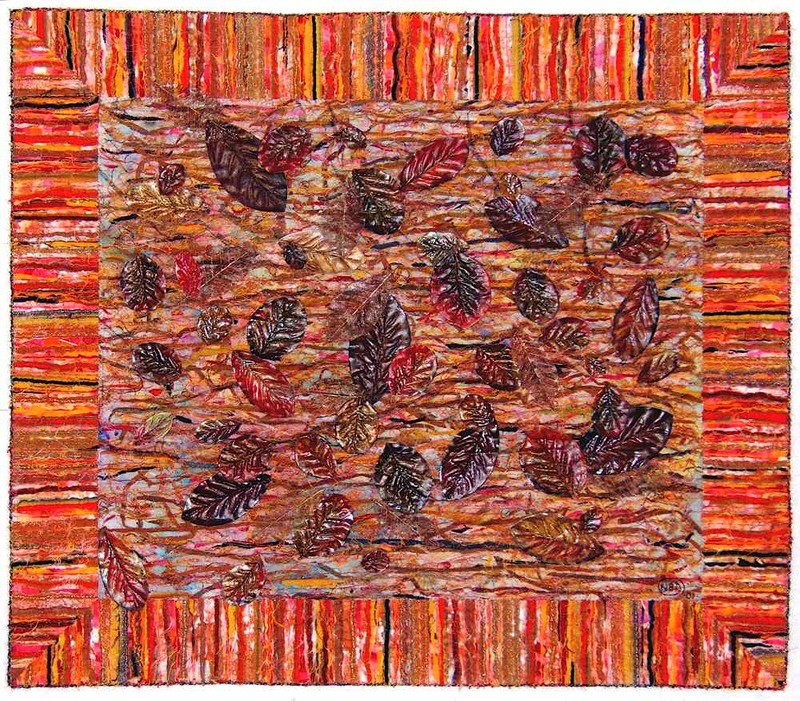 Inspired by a typical fall day. After the sun has gone down. 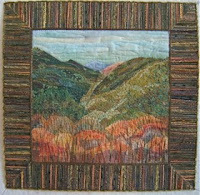 Inspired by a clear fall day in September. 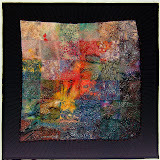 I developed a process to hand-quilt wrinkles into fabric. After the quilting is complete, the crinkle quilts re-enter the design process. Usually something more needs to be added or there are areas that need to be emphasized or DEemphasized. 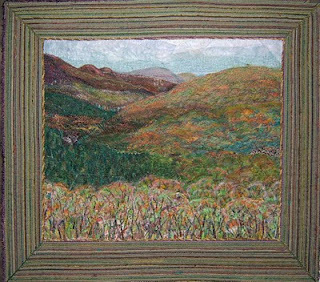 Paint or oil stick pastels are what gets used most often ... sometimes crayons. 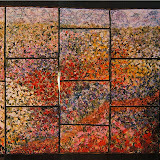 I use whichever medium will best serve the purpose to get the effect "demanded by the piece". These art pieces are framed. 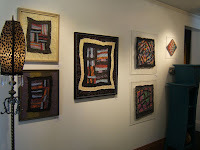 Some are matted within solid frames while others are mounted with tied knots on acrylic that stands away from the wall. 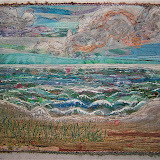 All have a "halo" (the ends of the stitching threads) framing the fabric art piece. 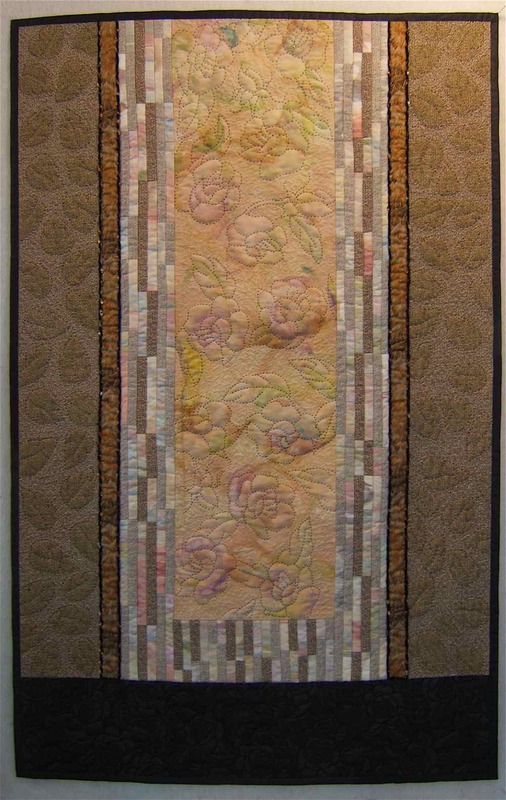 Hand-quilted and tied, machine stitched, and painted. 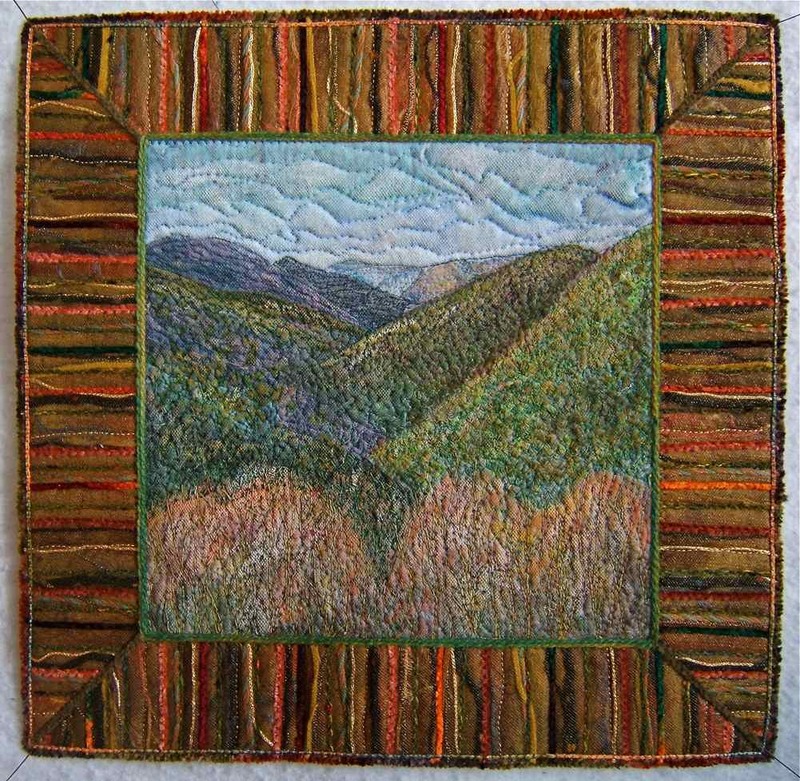 Second piece in the Smoky Mountain series created in my "ortwork" technique. 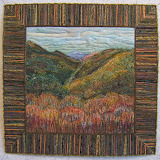 Mountain piece hanging in gallery. 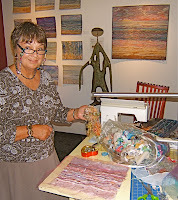 I'm demonstrating the "ortwork" technique at the gallery. 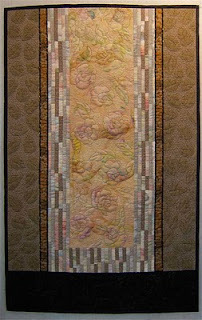 "Silk Roses" hanging in the gallery. 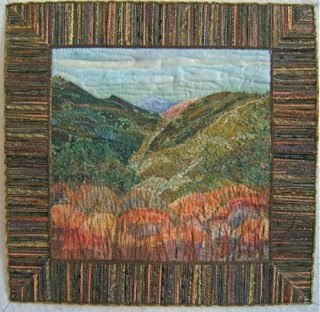 I have created art pieces using techniques that are more traditional in making utilitarian quilts. The center panel is hand-painted silk. 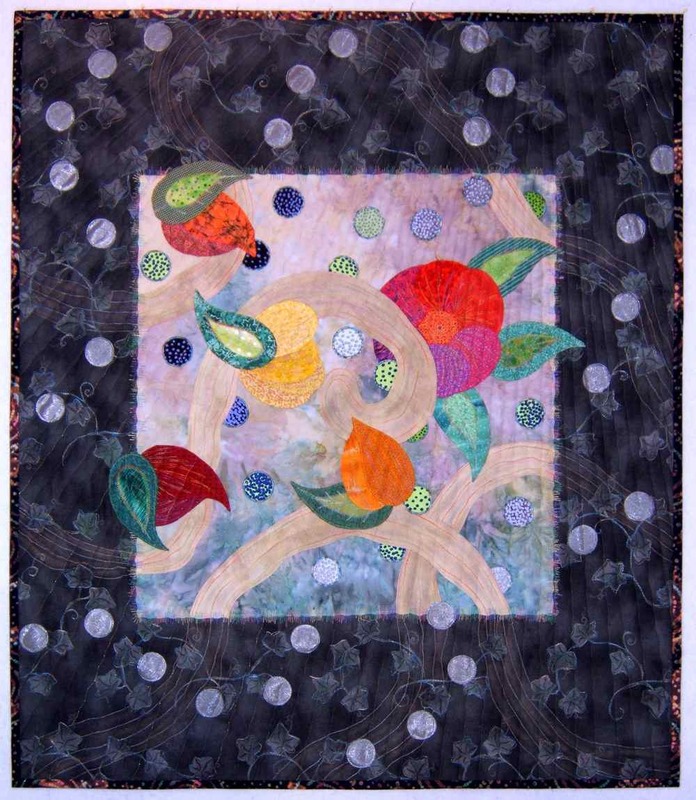 Most of the leaves in the side panels are quilted from shapes in the fabric on the back of the piece. 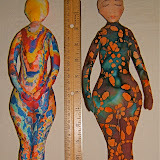 They are enhanced with oil paint stick. 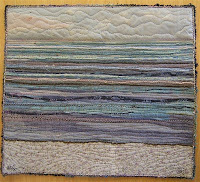 Hand and machine quilted, machine pieced, hand whipped stitches. 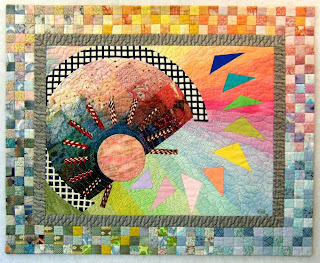 Only in the moonlight do you see bold shapes and colors. 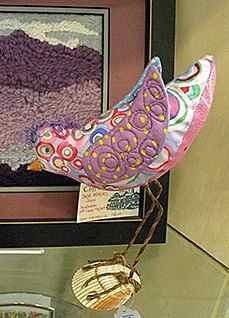 The flower petals and leaves are the same paisley shape. 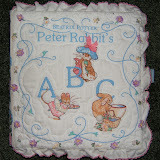 The circles in the border represent a bit of magic ... or are they fairies? Machine applique and machine quilting. 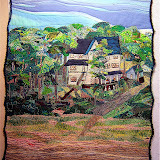 Hand-quilted, hand-applique, hand embroidery and needle lace, machine pieced. 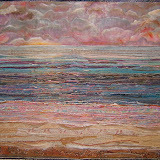 silk fabric; hand-dyed, upholstery & commercial cotton fabrics; acrylic paint; beads, mono-filament, metallic, and cotton thread. 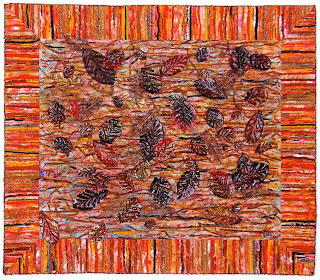 Real leaf skeletons and silk plant leaves are painted to adorn this piece. 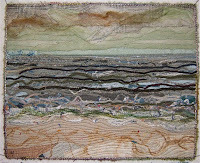 Ten layers of fabric are stitched, cut and shagged up for the border. 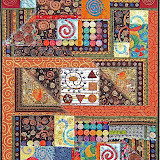 The ravels from the border are used in the background of the center in my "ortwork" technique. 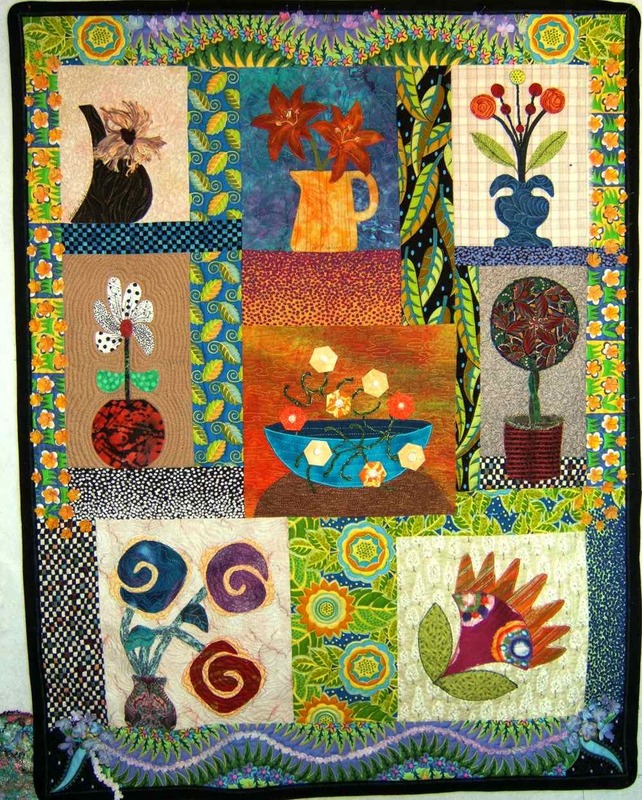 A collection of "flowers in containers" blocks created by Thursday Bee members of the Smoky Mountain Quilt Guild. Silk flowers are attached by their embroidered centers, while old buttons secure the origami folded flowers to the surface. 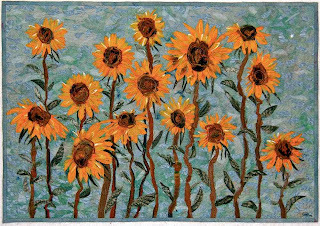 After viewing Van Gogh's flowers in an exhibit, I felt compelled to interpret his exuberance and style of painting into fiber. 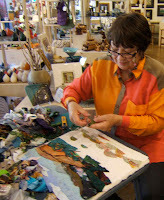 Hand-painted fabric, silk, synthetic, & cotton fabrics, hand-dyed roving, and tulle netting. 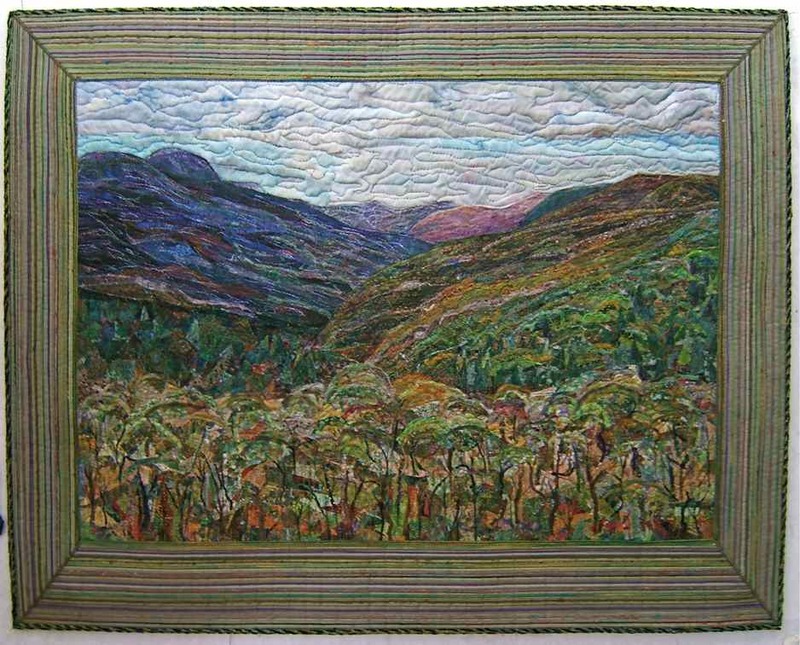 A series of art quilts featuring the view from Morton's Overlook. I took the photo from the big turn-off on the curve near the top of the Smokies, looking back into Tennessee. They are created in my "ortwork" technique. 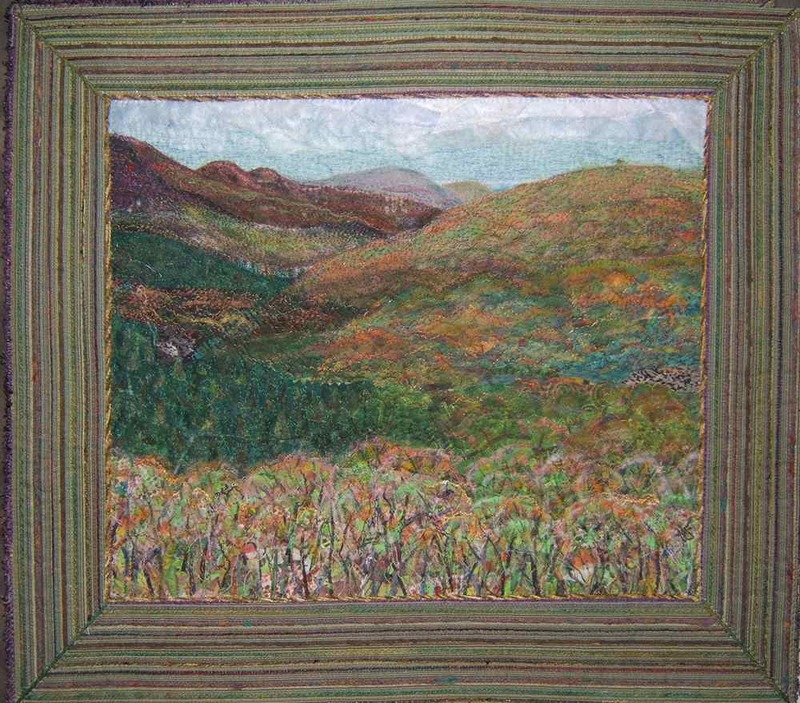 My interpretation of a photo I took in the Smoky Mountains. It's made in my "ortwork" technique using recylcled materials. 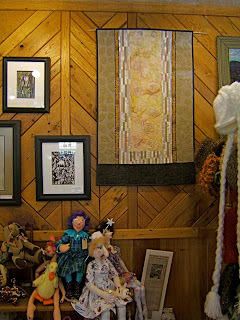 cotton fabric; cotton, metallic, & poly threads, oil pastels, watercolor pencils, yarn, wool roving, and tulle netting. 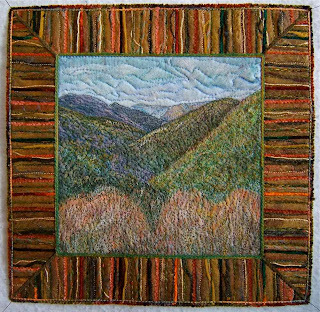 My interpretation of a photo I took from Morton's Overlook in the Smoky Mountains. Made in my "ortwork" technique. 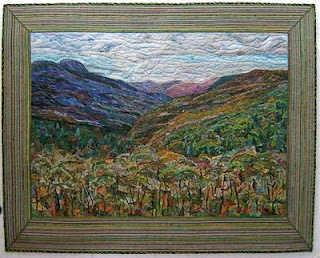 Created in honor of the great Smoky Mountains being designated an an international Reserve by the UN in observance of the park's 75th anniversary. 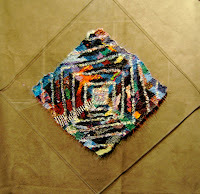 "Ortwork" technique. 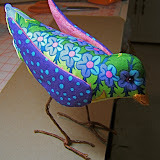 These colorful fabric birds made from a pattern I designed have quilted wings. Each stands on a natural object ... shell or driftwood.